The type of teaching materials and resources you use have a big impact on your student. It's important you set up a suitable guitar teaching curriculum that will suit each individual student. The common approach guitar teachers make is to try and use a 'one size fits all' curriculum. The idea is that you plan out a path students should take, then follow that curriculum with every student. Unfortunately, while it's easy to create a 'one size fits all' curriculum, it isn't ideal for students. This approach will hold your students back. Let's have a look at what makes a good guitar teaching curriculum and how you can create a high quality curriculum for your students. To create an effective curriculum, we need to understand what students really need when they come to see you. We could nitpick and find more reasons, but if you keep these three main points as your focus, you will do well as a guitar teacher. If one or more areas are neglected, the student can become frustrated. Example: if you focus all your lesson time on teaching new skills and techniques but the student doesn't feel like they are improving, they will get frustrated. Even if the student really is improving, they will get frustrated if they can't see that progress. For this reason it's very important that whatever guitar teaching curriculum you use, it must work towards all three points above. Many guitar teachers choose to teach out of a book as it's an easy way to teach. A book sets out a nice logical path for you to follow. The problem with teaching out of a book is that each student needs a different approach - something a book can't offer. It doesn't matter how good the book is, it won't keep all students happy. The reason for this is simple: every student has different learning needs. Using a book to teach every student isn't the most effective method because every student needs something slightly different. That's why it's so important to create a custom guitar teaching curriculum for each individual student. A custom curriculum allows you to ensure that each student is learning exactly what they need at any point in time. If at any point you need to change direction, you're able to do so. You have more flexibility with a custom curriculum compared to a book. Let's say you have a student who is having trouble understanding the basics of scales. Take a look at the list of Guitar Lesson Plans available on this page. You could try the first lesson plan and if that approach didn't work you could try one of the other resources. You have complete flexibility and can change approach as you need to. The point is that a custom curriculum gives you options - you choose how you want to teach using only the resources you feel are appropriate. On the other hand if you were teaching out of a book, you would only have immediate access to the one way the book explains scales. The fastest and easiest way to create your own guitar teaching curriculum is to use individual guitar lesson plans and combine them until you end up with the right combination for each student's needs. The basic idea is that you take a look at what each individual student needs to learn in the short and medium term, then pick out the relevant lesson plans that work towards those needs. You don't need to plan too far in advance because you're likely to want to change direction along the way. John has a new student wanting to learn to play the blues. The student is a complete beginner and wants to be able to jam along without learning too much theory. John starts off by thinking about what skills, techniques and theory the student will need to learn to be able to play the blues. Then he checks out our list of Guitar Lesson Plans and starts to put together a curriculum to fit this student's needs. He starts by looking at the most basic skills the student will need. He prints off lesson plans on how to hold the guitar, tuning the guitar, simple exercises etc. After the student learns the basics John prints more advanced lesson plans to teach the student how to memorize the notes on the fretboard, techniques such as hammer-ons, pull-offs, slides, bends etc. Then gradually John moves towards lesson plans on the pentatonic scale, blues scale, improvisation basics etc. After every lesson, John reviews his curriculum to make sure he is heading in the right direction and is covering all the important topics needed. The advantage here is that if John needs to change direction at any point, he can simply find the relevant lesson plans and add them to his curriculum. The reason why this is so effective is because you can specifically choose what to teach and what to leave for later (or avoid completely). You have complete control over what you teach your student and as a result you will be more effective as a teacher. Live and Teach Guitar Members have access to a wide range of lesson materials, plans, exercises and worksheets. All of these resources can easily be used to create a custom guitar teaching curriculum for each individual student. The best practice we can share from our members is to think of our lesson materials as an 'on-demand' service. At any time you can change the direction of your lessons and print off the relevant materials for your student. Five minutes before a lesson you could easily print and prepare your entire lesson's needs. The example below demonstrates the type of materials you would be able to instantly download and print to give to your students. The page on the left is the material you give to your student and the page to the right is a 'teacher guide' to give you advice on how to teach the material effectively. 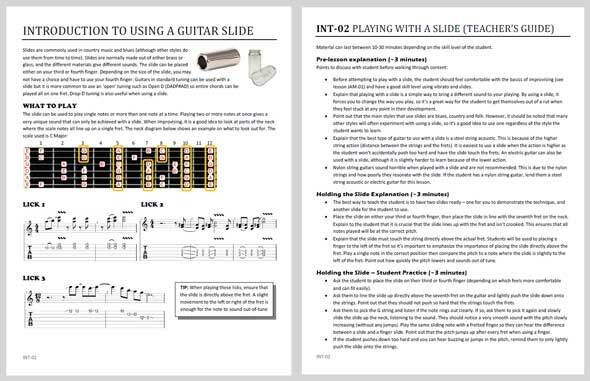 So for the above example, if you wanted to teach your student how to use a guitar slide, you would print this lesson plan off and simply read through the Teacher's Guide. The guide would explain minute by minute how you could give an entire 30 minute lesson around this topic. It explains what to talk about, what to ask the student to do and common issues students have. All of our lesson plans include a thorough Teacher's Guide so even if you need to teach a topic you're not familiar with, the guide will walk you through giving an effective lesson. To access all these resources now, become a Live and Teach Guitar Member.